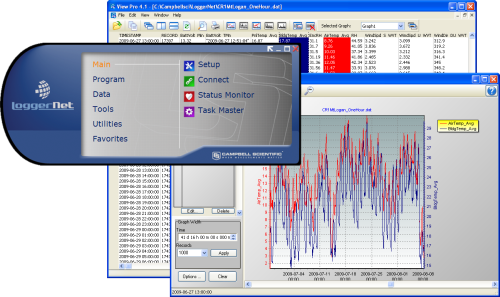 Data acquisition software is used for a variety of purposes: to support datalogger programming, enable communication between dataloggers and computers or mobile devices, manage data files, and display data in graphical formats. More advanced users can add custom capabilities or interfaces with our software development kits. What is the most basic, least expensive software that can be used to view and display data from Campbell Scientific dataloggers? PC200W, which is available free of charge from the PC200W product page on our website. When a new version of software is released, users of that software are entitled to a free patch or an upgrade at a discounted price, depending on the current license owned. A patch is offered to users who currently own a license for a version of the software that has the same major revision number as the new release. For example, if a user owns version 1 of the software and version 1.1 is released, the user can download a patch free of charge from our website. Upgrade pricing is offered to users who own a license that has a major revision number different from the new release. For example, if a user owns version 1 of the software and version 2 is released, the user can purchase an upgrade at a discounted price.